WE DID IT! 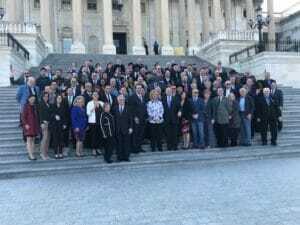 #IndustryUnited April 10-11, 2018 The first ever United Motorcoach Association (UMA) and American Bus Association (ABA) joint Bus and Motorcoach Industry Fly-in this week on Capitol Hill was a success! This was our opportunity to come to Washington, DC to interact with our Congressional delegates and important agency officials and make sure our voices are heard. Owners and senior management from bus and motorcoach companies from around the nation gathered to meet with our Congressional elected officials to discuss the industry's most pressing legislative issues. Raising our voices together for our Industry! We're glad to be a part of it! Thanks, Jason, for representing VIP! #vipchartercoach #CapitolHillDays #washingtonDC Members from both associations hit the pavement hard, visiting more than 150 Congressional offices. The first ever United Motorcoach Association (UMA) and American Bus Association (ABA) joint Bus and Motorcoach Industry Fly-in this week on Capitol Hill was a success! This was our opportunity to come to Washington, DC to interact with our Congressional delegates and important agency officials and make sure our voices are heard. Owners and senior management from bus and motorcoach companies from around the nation gathered to meet with our Congressional elected officials to discuss the industry’s most pressing legislative issues. Members from both associations hit the pavement hard, visiting more than 150 Congressional offices.